Just hang this clock within reach and you can easily glance to see the time, as well as reach to set the small timer at the bottom of the clock. To give you an idea on size, the dimensions of the clock are 8.5 x 12 x 2.5”. 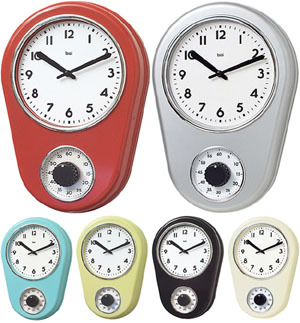 The clock comes in a total of 6 very retro colors, black, chartreuce, red, silver, turquoise and white. You can find these cool clocks for $29 from Pure Modern. Which is a touch on the pricey side, but it’s not too shabby either.